British forces in Afghanistan have defended their decision to call in US planes to drop 500lb bombs on Taleban fighters in a town in Helmand province. Witnesses say there were many civilian deaths and injuries but UK forces said there was no evidence of any. 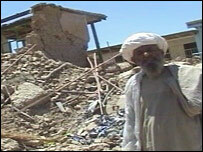 Civilians in Nawzad told the BBC that aircraft dropped at least three bombs, destroying shops and a school. British forces have been protecting the district government headquarters in Nawzad for a month. Much of the town's market of 150 shops has been reduced to rubble and there are deep craters where the bombs struck. The newly built two-storey school received a direct hit, causing its concrete roof to collapse. British troops said the school was being used by the Taleban to launch mortars. Another building has reinforced concrete rods jutting out from its crumbling walls in the shape of a bomb blast. People in the town said no warning was given by the Taleban or the coalition that the fighting or bombing would begin. Shopkeeper and village elder Haji Ahmad said: "We don't have an accurate number of dead people but there are bodies under the rubble, and there is no-one here to take them out. "There are more than 50 killed, not less." Naimat Ullah Noori from the school said: "[It] is destroyed, the students can no longer come here. "We ask the international community to come and rebuild the school so that the children can study and our country can develop. "If you can bomb a school then you can bomb anywhere. Schools are such important places in society." The town has become a front line between a small force of British soldiers and the Taleban fighters who are bombarding them from just a few hundred metres away. It is too dangerous for westerners to travel there and the BBC's local reporter was fired upon as he tried to piece together what happened. UK commanders said they had been under constant attack for the past two weeks and the Taleban fighters were close to overrunning the base when the US air strike was called in. There are reports of anything from 25 to 200 people being killed but it is almost impossible to verify. The governor of Helmand said 19 people had been killed and they were all Taleban. The commander of the Helmand taskforce, Col Charlie Knaggs, said there was no evidence of civilian casualties and the force used was necessary to protect his troops. The British forces admit they will only achieve security and development through winning hearts and minds, but they always said if attacked they would reply with deadly force. It is a difficult balance to strike when fighting a war.